SSC CHSL Examination notification 2019 is out today on 5th March 2019. SSC Recruitment department conducts SSC CHSL Exam every years to selected candidates for clerk and Data entry jobs under Government of India. Pay Band -1 (Rs. 5200-20200)+Grade Pay: Rs. 1900 (pre-revised). Pay Band-1 (Rs. 5200-20200)+Grade Pay: Rs. 2400 (pre-revised). Education: All Indian candidates who have passed in their 12th class examination from any stream can apply for this SSC CHSL Recruitment 2019. 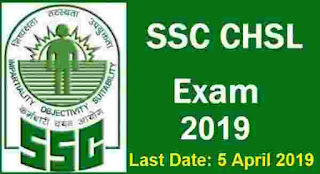 Those who lies in between this age criteria can apply for this SSC CHSL Exam 2019. Paying Method for the application fee: candidates can pay the application fee through the online payment. Various online payment method which you can use are: “ DEBIT Cards/Credit Cards/Internet Banking”. 1 SSC CHSL Exam applications must be submitted through online mode only at the official website of SSC Headquarters i.e. https://ssc.nic.in. 2 Last date for submission of online applications is 05th April 2019 (5.00 PM). 3 Applicants are advised in their own interest to submit online applications much before the closing date and not to wait till the last date to avoid the possibility of disconnection/ inability or failure to login to the SSC website on account of heavy load on the website during the closing days. 4 The Staff Selection Commission does not accept any responsibility for the applicants not being able to submit their applications within the last date on account of the aforesaid reasons or for any other reason beyond the control of the Commission. 5TH March 2019 is the opening Date to Apply. 5th April 2019 is the Last Date to Apply. 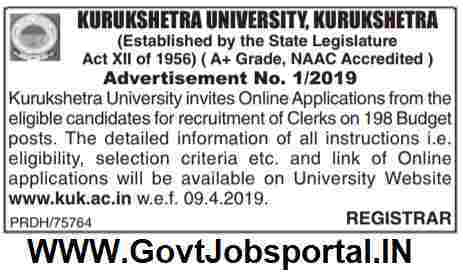 Kurukshetra University Recruitment for Clerk posts 2019. Today on 3rd March 2019 Kurukshetra University launched a news on their official website as well on “The Tribune” Newspaper related to the recruitment process of clerk posts. This is a great news for the candidates who are looking for the Government jobs in Haryana. Strat preparing for the Aptitude test which will be take place for the selection of the candidates. 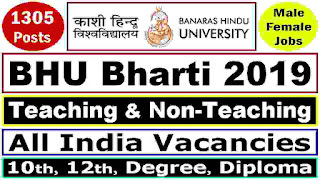 Kurukshetra University Recruitment department said that there are total 198 vacant posts which are going to be filled up through this Government job recruitment process 2019. You can check this official news on the newspaper as well as on the website of the university. Official Notification related to the Eligibility Criteria and other term and conditions will be post on 9th APRIL 2019. We will share the complete details related to the upcoming Notification on 9th April 2019. It is just a Notice which is officially out in the various Newspapers as well on the official website of Kurukshetra University. Online Applications are invited from the eligible candidates for recruitment of Clerks. The detailed information of all instructions i.e. eligibility, selection criteria etc. and link of Online applications will be available on University Website www.kuk.ac.in w.e.f. 09.4.2019. ESIC Recruitment 2019 for clerk posts through out India. ESIC is stands for “Employees’ State Insurance Corporation” has released employment notice for UDC (Upper Division Clerk) and Stenographer Post Vacancies in India. Qualified and Concerned applicants can apply through online mode only through the official website. Applicants can apply for this ESIC Recruitment for UDC, Stenographer posts from 16th March 2019 to 15th April 2019. 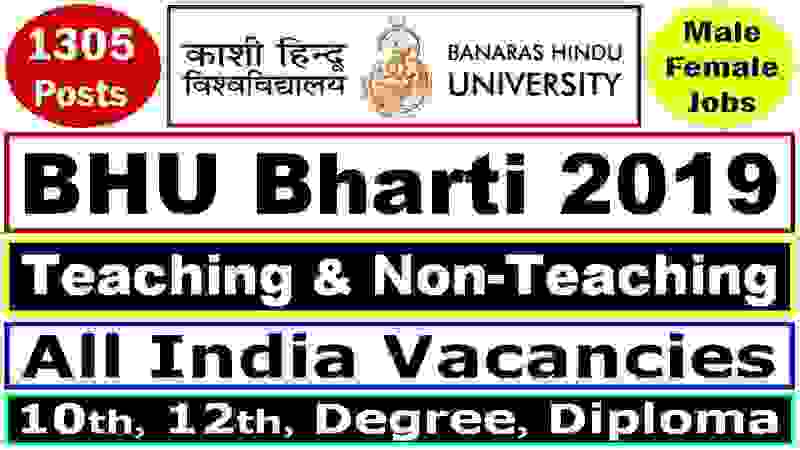 Only online applications are accepted for this ESIC Recruitment for UDC and Steno posts. More information related to this Recruitment process is explained below in various sections. So check the whole article carefully before applying. DAV Public School recruitment for teaching and Non-Teaching job profiles. DAV Public School Palampur is looking to recruit fresher PGT, TGT, PRT posts under teaching profession. There are also various Non-Teaching job profiles such as Lower Division Clerk, Driver & Lab Assistant which are also going to be filling up through this DAV Public School recruitment process 2019. 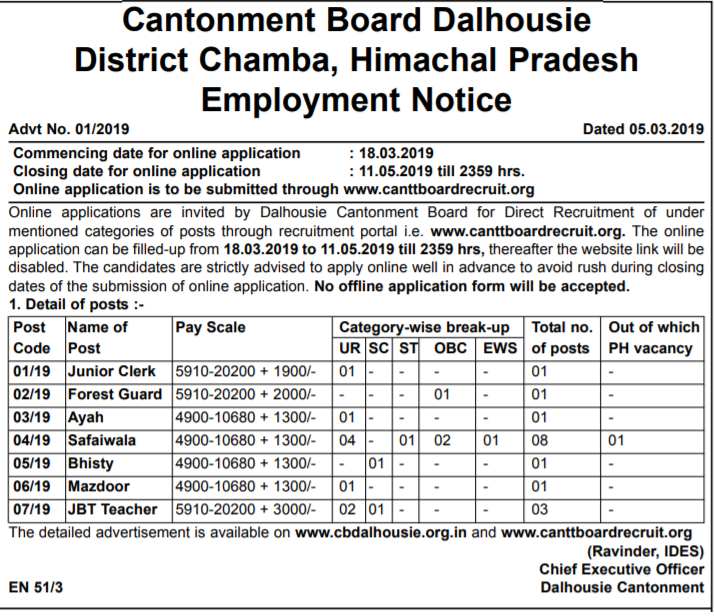 Detail information related to these Government jobs under DAV school is given below in this job posting. We took this information from The Tribune newspaper published on 24th Feb. 019. We also share the Newspaper screen shot under IMPORTANT LINK section. Eligibility Criteria: As per norms, TGT’s should be TET qualified and PRT’s should be JBT TET / D.El.Ed. qualified. For Clerk should have full familiarity with tally and other software used in the school for Audit & Admn. work. Proficiency to teach through English Medium, experience of a reputed Public School, interest in co-curricular activities. Salary: Handsome salary comparable to State Govt. Deserving candidates may be kept on Probation. The Management reserves the right to abolish or create any of the posts. Application Fee for Applying: Applications on the prescribed form available from the office of D.A.V. Public School, Palampur (HP) on payment of Rs. 100/- by a demand draft in favour of Principal, DAV Public School payable at Palampur (HP) should reach the Principal, D.A.V. Public School, Palampur (HP) – 176061 along with a handwritten application within 10 days of the publication of this advertisement. Application Process: Applications should indicate clearly the Post & the Subject applying for. Application form can also be downloaded from the website of the school i.e. 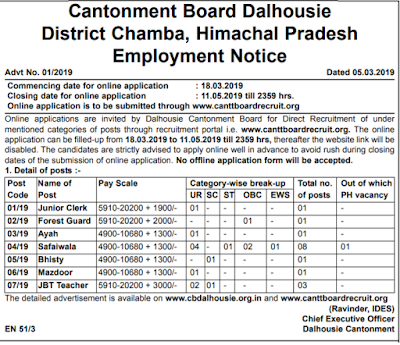 www.davpalampur.com Incomplete applications or applications without the prescribed form will not be accepted and only short listed candidates will be called for written test / interview. Application Should be Reach Within 10 Day of Publication.